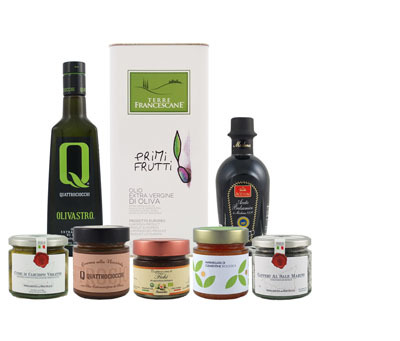 QUATTROCIOCCHI OLIVASTRO: This extra virgin olive oil is produced exclusively from 100% Itrana variety olives locally grown on the Quattrociocchi Estate in Alatri. This oil has a fruity aroma enhanced by complex notes of grass, artichoke, green tomato and apple. Its flavor is pleasantly balanced in bitter and spiciness with hints of green almond. ORO DEL DESIERTO PICUAL: This organic extra virgin olive oil, pressed from 100% Picual variety olives, is a medium-intense fruity oil and golden green in color. Its aroma is strong and well-rounded with fruity notes of ripe tomato and banana enriched with spicy hints of black pepper, mint and oregano. Its taste is robust with harmonious vegetal notes and a definite almond finish. OLEOESTEPA ESTEPA VIRGEN: First place winner at the highly prestigious 2013 Mario Solinas awards from the International Olive Oil Council, Estepa Virgen is pressed from fresh, unripe olives picked at the beginning of the harvest when the olives just begin to ripen on the trees and the color begins to turn red, known as “envero”. This produces an oil that is intensely fruity with moderate intensities of bitterness and spice. A delightfully complex oil for the discerning palette, this oil comes with an attractive box as pictured and makes an ideal gift for the gourmet foodie. OLIO DE CARLO TENUTA TORRE DI MOSSA DOP:A prestigious award-winner and produced in limited production, Torre di Mossa is the historic farm of the De Carlo family and epitomizes the family’s idea of quality. Stone crushed and cold-extracted from Coratina olives this oil is elegant and expansive, characterized by the scent of olives and fresh cut grass as well as hints of artichokes and green almonds. Sweet upon initial impact, it soon reveals an intense, persistent hint of pepper and tickles the taste buds with a persistent sensation of vitality.